The Latino Theater Company and IAMA Theater collaborate to bring Jonathan Caren's world premiere play to life. Labor Day weekend in 2016 -- right before everything in America changed. A daring new play about a man in search of a better view from his deck deep within a canyon and the people who either help him get it, or stand in his way. "...The in-the-round staging means that not everybody in the audience can catch every significant expression, but director Whitney White choreographs the action with a sure hand and deft comic timing. The play stumbles only at the very end, but by then "Canyon" has unnervingly reminded us: None of us really knows how we'd behave in a crisis." 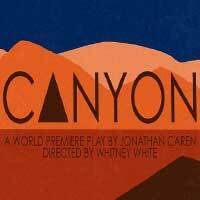 "...Scenic designer Daniel Soule does a terrific job on a three-sided stage epitomizing canyon, desert, and everyone's dreams. The audience can almost feel the desiccated breezes and see the multicolored peaks beyond. R. S. Buck's lighting and Jeff Gardner's sound combine to expand the effects of sun and shadow. Melissa Trn's costumes have the feel of reality. The entire production team has outdone itself in creating a vivid setting to match the author's words. CANYON is a superb depiction of ordinary people who face extraordinary challenges. Dollops of humor help alleviate the pain inherent in such an exploration." "...Memories of the way we were pre-Election 2016 ignite Jonathan Caren's Canyon, the explosive latest from IAMA Theatre Company, Latino Theater Company, and the playwright who gave IAMA its much-awarded The Recommendation a half-dozen or so years back." "...The show does a good job of creating tension in the first half, and there is an unsettling undertone to the interactions between Eduardo and Jake. However, the constant hints at Jake and Beth's political beliefs at times feel a bit forced." "...Under the inspired direction of Whitney White, the play plunges head long into the territory of the current time with its rising racism, the increasing divide between the haves and the have-nots, and, inevitably, into the witches stew of illegal immigration, the situation of long-residing, undocumented citizens, and the inflamed rhetoric of those in power. Jonathan Caren's terrific, tightly plotted script puts it all on the table, served up and steaming, played with gusto by a first class cast of superb actors. Their performances are subtle and searing, comedic early on and increasingly dark as the existential nightmare tightens."